The Warminster cycle stand is made using Furnitubes classic Warminster Medium bollards that have been adapted to support one galvanised steel rail to create a traditional looking cycle stand. 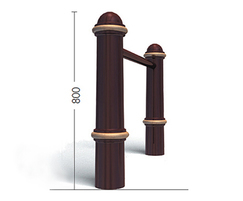 The Warminster bollards are cast iron with a primed finish as standard and the steel is galvanised. A painted finish is available upon request.